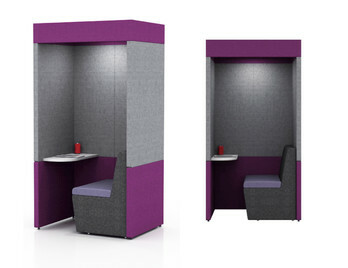 Acoustic Pods are increasingly popular mainly due to the increasing need to create meeting spaces and ‘quiet zones’ within open plan offices or other open areas. 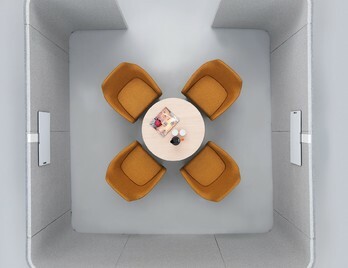 Acoustic Pods create a room within a room and are now available with a number of features such as led lighting controlled by infra-red, whiteboard panels, TV monitor units and air circulation units to make each meeting or user session as comfortable as possible. 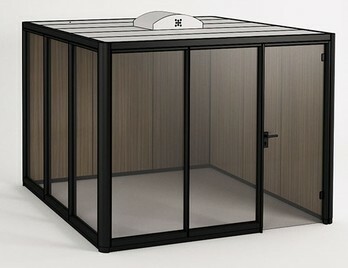 The Fresh Pod Team is a fully enclosed space for complete privacy and is available in the large version as shown here and the smaller Duo version. 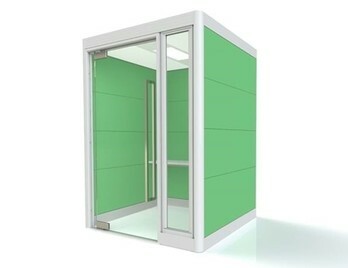 Each pod comes with air circulation fan, to a sliding door and glazed panels keeping the Pod light, airy and fresh. Harbour Team Booth provides a peaceful environment for phone calls, video conferences, private meetings and a silent retreat for concentrated and uninterrupted work for 4 to 6 people. 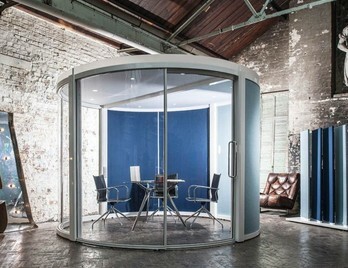 Harbour Pod Duo provides a peaceful environment for phone calls, video conferences, private meetings and a silent retreat for concentrated and uninterrupted work for up to 2 people. 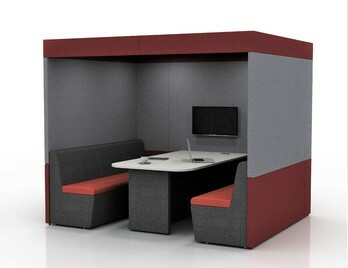 Harbour Pod Duo can also be used as a dedicated team working space, where people can focus and concentrate on any task by removing themselves away from normal office distractions. 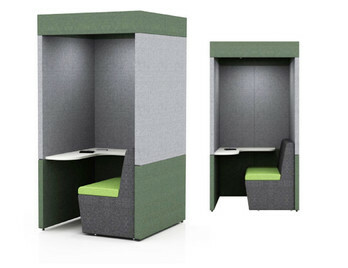 Meeting Pod 3x3 is an acoustically enhanced meeting Pod which allows and ensures the team using it can meet in privacy, whenever necessary. 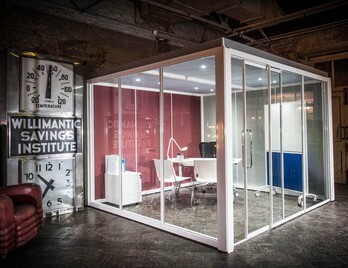 The Pod is ideal for larger team discussions, presentations, brainstorms or pitch creation. As the hydraulically closing door shuts quietly the ambient lighting and ventilation automatically switches on, offering a pleasant internal environment for each user. 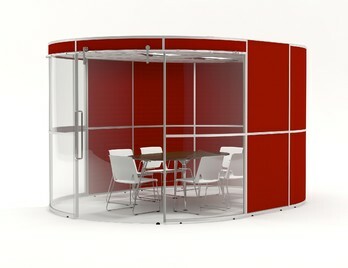 Sky Pod 1 an acoustically enhanced meeting Pod which allows and ensures work in complete privacy, whenever necessary. 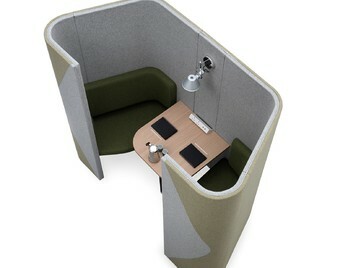 The Pod is ideal for individuals looking for a quiet space in order to work without interruption and noise distraction. As the hydraulically closing door shuts quietly the ambient lighting and ventilation automatically switches on, offering a pleasant internal environment for each user. Sky Pod 2 is an acoustically enhanced meeting Pod which allows and ensures work and collaboration in complete privacy, whenever necessary. 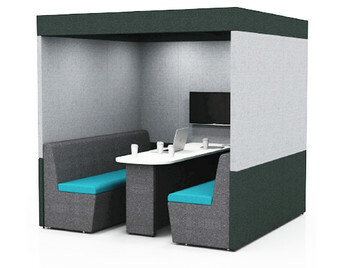 Sky Pod 2 is ideal for individuals or teams looking for a quiet space in order to work and collaborate without interruption and noise distraction. As the hydraulically closing door shuts quietly the ambient lighting and ventilation automatically switches on, offering a pleasant internal environment for each user. 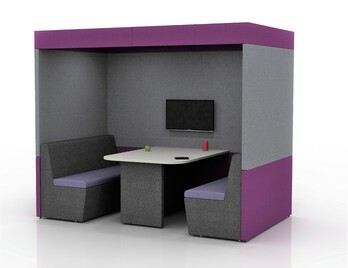 Pod lite 2000 is an excellent informal yet private meeting space for those wanting to 'touch down' or collaborate in an open environment whilst retaining a degree of privacy. 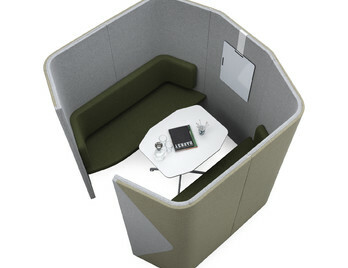 Pod Lite Round is an excellent informal yet private meeting space for those wanting to 'touch down' or collaborate in an open environment whilst retaining a degree of privacy. 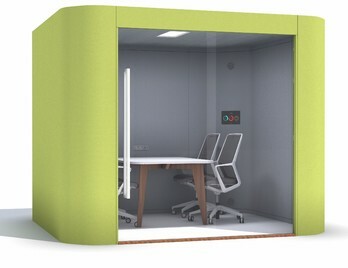 The pod has an acoustical ceiling with integral LED light which is operated by infra-red. 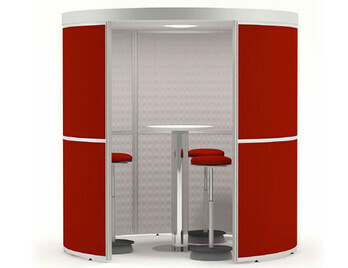 Acoustic lined upholstered panels are housed within an anodised aluminium frame with an open front allowing people to leave or join in a more informal manner. 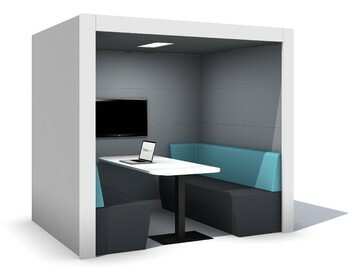 Pod Lite 3D is an excellent informal yet private meeting space for those wanting to 'touch down' or collaborate in an open environment whilst retaining a degree of privacy. 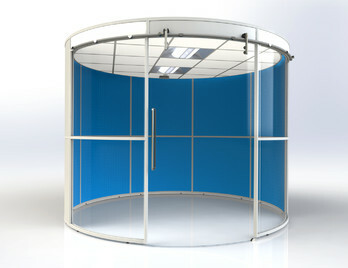 The pod has an acoustical ceiling with integral LED light which is operated by infra-red. Acoustic lined upholstered panels are housed within an anodised aluminium frame with infrared technology linked to LED lighting and ventilation. Pod Lite Oval is an excellent acoustically treated meeting space for those wanting to 'touch down' or collaborate in an open environment whilst retaining a degree of privacy. The Pod Lite Oval has an acoustical ceiling with integral LED light which is operated by infra-red. Acoustic lined upholstered panels are housed within an anodised aluminium frame with infra red technology linked to LED lighting and ventilation. Haven Pods nestle and tessellate to maximise available space, allowing a considered creation of community, environments and destinations. 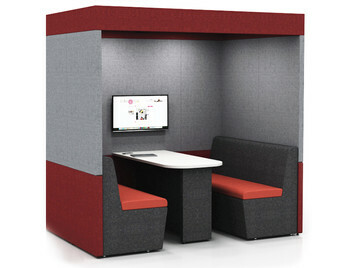 Haven Pods are ideal for either an individual looking for space to focus or for teams to gather for impromptu meetings. These pods are available in two widths and at mid-height and full height and are upholstered in Camira's acoustic wool based fabric Blazer. Haven Pod Team Work compromises nine upholstered panels in Camira's acoustic wool based fabric Blazer and is full height at 1800mm high. Team Pod creates an informal environment where groups can focus or teams can gather for the morning briefing a quick brainstorm or an afternoon coffee. The Pods space efficient and geometric design also enhances the acoustic performance of the product and can be combined to create a hive style landscape. Haven Pod Team Work compromises eleven upholstered panels in Camira's acoustic wool based fabric Blazer and is full height at 1800mm high. Haven Pod Team Work creates an informal environment where groups can focus or teams can gather for the morning briefing a quick brainstorm or an afternoon coffee. The Pods space efficient and geometric design also enhances the acoustic performance of the product and can be combined to create a hive style landscape. 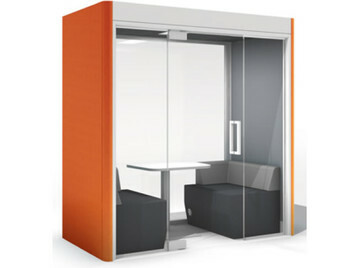 Qube Meeting Pods provide an excellent solution when creating privacy and collaboration spaces within working environments. They are designed as freestanding units and feature a structural framework with demountable panel system so are simple to install and reconfigure. 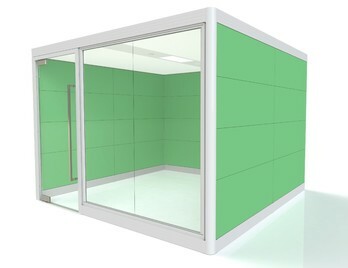 Bespoke options of Qube Meeting Pods are also available and full design service available and assessment prior to ordering. 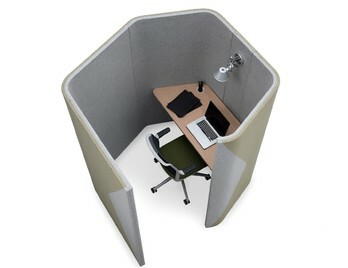 Orb Pod is a fully enclosed circular office pod system with an acoustic rating of 29dB. 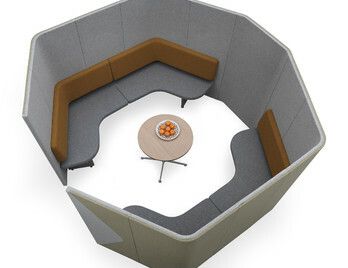 The Orb acoustic pod is great way to establish a dedicated meeting zone which allows users to enclose themselves away from a busy or noisy environment. 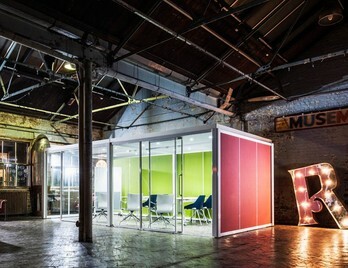 Each Pod has an aluminium framework which frames the clear panels. The pod can be fully glazed to allow as much light in as possible or you can opt for three clear glazed acrylic panels and three upholstered panels to have the best of both worlds. 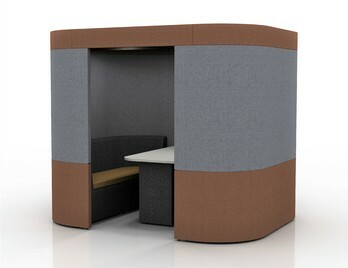 Block Pod is a fully linear office pod system with an acoustic rating of 29dB. 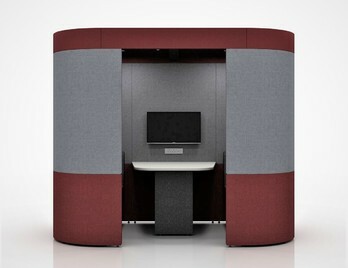 The Block Pod acoustic pod is great way to establish a dedicated meeting zone which allows users to enclose themselves away from a busy or noisy environment. Each Pod has an aluminium framework which frames the clear panels. The pod can be fully glazed to allow as much light in as possible or you can opt for five clear glazed acrylic panels and six upholstered panels to have the best of both worlds. Zen Solo Plus provides a complete wellness solution for those looking for a breakout space and a calming place for work and concentration. It has a larger footprint than Zen Solo so allows you a more 'thinking space'. Zen Solo Plus has an ergonomic desktop with a generous surface area. 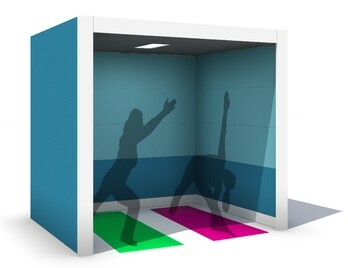 The Zen system is flexible and can easily be modified to fit your space, we can even provide a free site survey and technical drawings prior to ordering. We offer a comprehensive selection of different styles of Acoustic Pods and we can tailor each one to your specification including size, interior technical specification and even your own manifestation in form of company logo or branding. 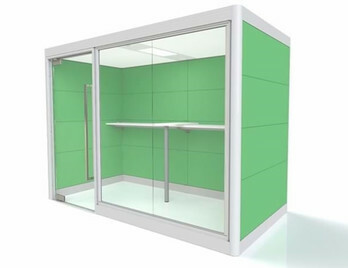 We also supply more ‘laissez faire’ style Pods which are open, soft accessible units, these pods offer a place to meet and discuss but they are not fully protected or enclosed from external office ambient noise. 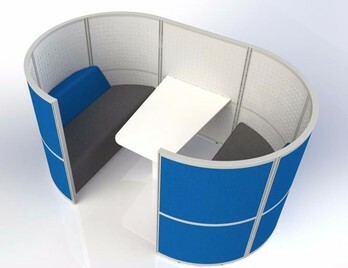 These type of Pods are usually covered in acoustical treated fabrics which help absorb noise both internally and externally, there is still significant improvement in hearing speech and communication when using these Pods compared to a standard open meeting table and chair arrangement. The other benefit of Office Pods is that they are freestanding and do not need to be fixed to any internal walls or ceilings which means they can be moved or relocated if required. This also means that there are savings when you compare the costs against the removal of fixed partitions and less negotiations with landlords as they will be classed as ‘loose furniture’ items. Acoustic Pods are not only limited to office environments as they function well in open foyers, hospitals, schools and colleges.